2017 Throwback: Boy's 200m, Age 17-18 - Tyrese Cooper Runs 20.63! 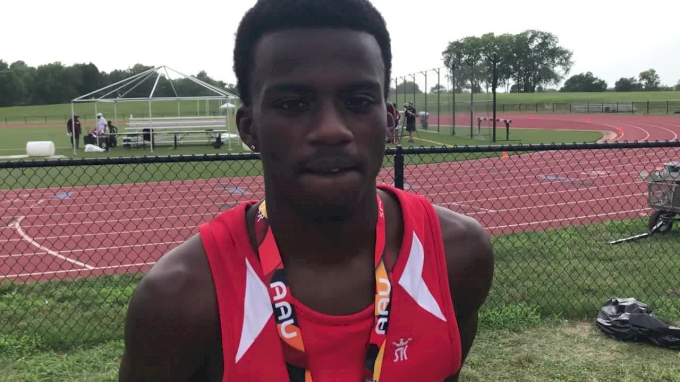 Mic'd Up: Brandon Miller's AAU Junior Olympic Games 800m Win! Brandon Miller Slashes A Second Off The AAU 1500m Record: 3:58.10! Epic Showdown: Krianne McBride Holds Off Cha'iel Johnson In 1500m Final! 2016 Throwback: Girl's 800m, Age 17-18 - Gabrielle Wilkinson AAU Record! 2016 Throwback: Girl's 200m, Age 11 - Avery Lewis 25.69! 2016 Throwback: Girl's 800m, Age 8 & Under - Damira Allen AAU Record! 2016 Throwback: Girl's 100m, Age 17-18 - KaTia Seymour Runs 11.59! 2016 Throwback: Boy's 4x800m Relay, Age 12 - MGX Sets National Record! 2016 Throwback: Girl's 400m, Age 8 & Under - Damira Allen FTW! We're Here At The 2018 AAU Junior Olympic Games! 2016 Throwback: Girl's 1500m, Age 8 & Under - Damira Allen FTW!